Can financial literacy courses for children turn that around? Tennessee has a model program for financial literacy in its public schools. All high school students must pass a personal finance course to graduate, and even kindergartners are learning about money under a new initiative to extend the curriculum to primary school. But you wouldn’t know it from the state’s bankruptcy rate. Last year, Tennessee again led the nation in bankruptcies, with more than 36,000 filings, or about six for every 1,000 residents. That’s twice the national average. 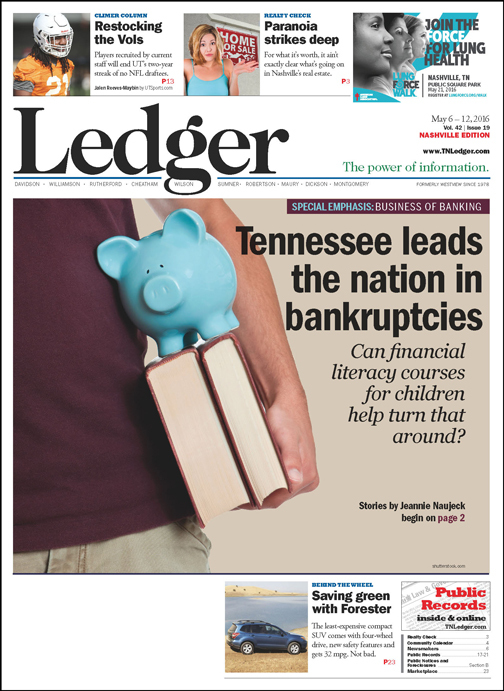 But while current statistics may not reflect it, state officials say they hope to change Tennessee’s “culture of bankruptcy” by planting the seeds of consumer financial education as early as grade school in the hope that future generations will do better. “Tennessee as a state has been at the top of its game as far as financial management of the state’s resources,” says Joy Harris, assistant treasurer for financial empowerment at the state Department of the Treasury. As students learn to manage their money responsibly, state officials say they hope they will take that knowledge home and share it with their parents. The Treasury has set the goal of transforming Tennessee from the state with the most bankruptcy filings to the state with the lowest debt per citizen and highest college and retirement savings per capita. To get there, Harris’ agency and many others are working to improve financial literacy among Tennesseans. In fact, Tennessee has one of the nation’s leading programs to teach children money basics. The General Assembly passed a law requiring a semester-long course in personal finance to be added to the public high school curriculum in addition to a required economics course. Subject matter covered in the course includes financial responsibility and personal decision-making, education, careers, and income, planning and money management, credit and debt, risk management and saving and investing. “Our biggest challenge is transitioning that knowledge into behavior,” acknowledges Jackie Morgan, senior economic and financial education specialist at the Federal Reserve’s Nashville branch. That means targeting students with lessons that are relevant to their stage of life, such as teaching the costs of buying and maintaining a car for students who are learning to drive, and lessons on credit, student loans and budgeting for upperclassmen who are thinking about whether to go to college or get a job. Efforts to expand financial lessons to grammar school are well underway. In 2010, State Treasurer David Lillard established the Tennessee Financial Literacy Commission to train teachers to introduce and promote financial literacy beginning in kindergarten. That’s backed by a Pricewater-houseCoopers report, Bridging the Financial Literacy Gap, which found that while 67 percent of K-12 teachers think financial education should start in elementary school, few are actually teaching it due to lack of support and training. Since 2012, Tennessee’s Financial Literacy Commission has trained more than 3,000 K-8 teachers, representing more than 141,500 students, in the Financial Fitness for Life curriculum. Teachers also receive training on how to manage their own money and maximize their state benefits, including their pension and deferred compensation plans. Those efforts earned Tennessee an ‘A’ in the 2015 National Report Card on State Efforts to Improve Financial Literacy in High Schools, issued by the Champlain College (Vermont) Center for Financial Literacy. Tennessee was one of five states to get an A. “Our bankruptcy rate is high but in terms of teaching and requiring financial education in our schools we’re actually one of the leading states,” says Chris Holmes, president and CEO of FirstBank, who serves on the Financial Literacy Council. Tennessee bankers also are active in classroom education. More than 100 banks participate in the Personal Economics Program, a consumer education effort that sends volunteer bankers to schools and communities to teach the public about banking and personal financial management. They also participate in Get Smart About Credit Day in October and host events for Teach Children to Save Day, held April 29. FirstBank sends bankers into schools in its markets through a Teach Children to Save program and supports Junior Achievement’s program that teaches school children about how the economy and banks work, as well as how to save, budget, spend and meet a payroll by “operating” a business or bank. Regions Bank sends associates into schools to teach a personal financial course that includes budgeting, saving, how loans work and the like. Regions employees teach at Metro Nashville Public Schools, as well as Tennessee State University and Vanderbilt University, both of which require student athletes to take the course before they can receive their scholarship checks. “I was a corporate finance major in college and never had one class on personal finance,” says Brian O’Meara, vice president and marketing director for Regions Bank. The cost of financial illiteracy is high. Three-quarters of Americans say they live paycheck to paycheck, and numerous surveys find a majority of households – even those with high incomes – don’t have enough cash on hand to pay for an unexpected expense. A third of households do not save any money, according to the National Foundation for Credit Counseling, and 30 percent save less than $100 a month. In addition, 30 percent of the people living paycheck to paycheck make more than $100,000 a year, according to Alliant Credit Union. “When I was a branch manager, I had clients who had a combined income of more than $500,000 and no savings,” O’Meara points out. 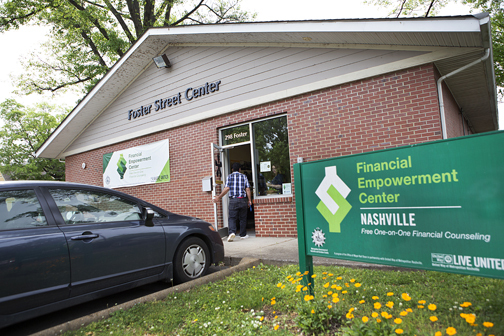 Financial Empowerment Centers, like this one in East Nashville, are found throughout the city. Here, financial counselors teach the benefits of using a bank rather than the “shadow” financial system of check-cashing businesses and high-interest lenders and urge consumers to build a savings fund to cover emergencies. Ken DeJarnette, a former banker who now works for Operation Hope, an organization that provides free financial counseling, says clients come to him making anywhere from $10,000 to $100,000. “Just because you make a lot of money doesn’t mean you are good with it,” he says. “It is frightening how close to the edge we live. We are one relatively minor emergency away from being in a tight spot and that’s why you see more check cashing places than you do bank branches,” he adds. Not having an emergency fund – personal finance guru Dave Ramsey recommends socking away $1,000 as one of his “baby steps” – can lead to a “debt trap” if a crisis strikes and a consumer is forced to use an alternative financial service provider such as a payday lender that charges exorbitant fees for small short-term loans. Such loans carry huge fees. One client who got a $600 loan through MaxLend, a payday loan provider, paid back a total of $1,847.59 over five months – more than three times the original loan amount. Payday loans are meant to be short-term, so judging the interest on an annual percentage basis may not be entirely fair. Another argument is that payday lenders meet a need for small loans that traditional banks do not offer. For many people, there is nowhere else to go. “I am not advocating for payday loans, but it’s true there’s just not really an alternative in the mainstream financial system,” says Natasha Bishop of Apprisen, a debt and financial counseling agency that changed its name from Consumer Credit Counseling Services in 2012. “It can be a calculation for people of, “Do I pay the $50 fee to pay off this $200 loan, or do I let my bank account overdraft four times, in which case I’m paying over $100, potentially? Where do all these people go if they don’t have that option? One of those alternatives is the “flex loan,” a new line of credit type of product offered by payday lenders like Advance Financial. The flex loan comes with interest rates and daily fees that can total a whopping 279.6 percent annually and are described as “a debt trap” by the Center for Responsible Lending. 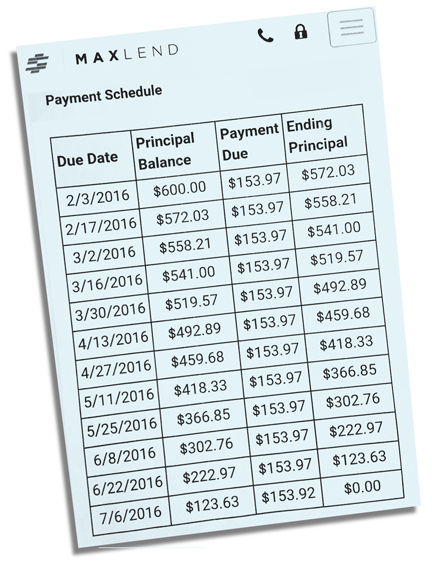 A payment schedule provided by a client of Operation Hope, an organization that provides free financial counseling. But in 2014, Tennessee became one of the first states in the country to allow flex loans after the payday lending lobby gave state legislators more than $400,000 in campaign contributions, according to an investigation by Nashville’s WTVF-TV. Among those recipients was the bill’s sponsor, Cameron Sexton, R-Crossville, who accepted thousands of dollars from the lending lobby around the time of the bill and told fellow legislators that the highest rate they could charge consumers was 24 percent, the station reported. The bill passed the General Assembly in 2014 practically unchallenged. “You’re taking the people who can least afford this and they are just getting hammered,” DeJarnette says. Consumers who have fallen into the debt trap – or those who just want to improve their financial literacy – have many resources that offer free assistance to adults. The Nashville Mayor’s Office sponsors Financial Empowerment Centers in East Nashville and South Nashville (at Casa Azafrán Community Center) and 10 satellite locations, generally lower-income areas and ethnically diverse neighborhoods in which residents may not trust the banking system. Counselors teach the benefits of using a bank rather than the “shadow” financial system of check-cashing businesses and high-interest lenders and urge consumers to build an emergency savings fund to cover emergencies. Financial coaching – including developing a budget, paying down debt, saving for college or improving a credit score – is free for anyone at any income level. Since opening in March 2013, the centers have helped more than 4,000 people reduce their debt by nearly $3.5 million and helped them save more than $650,000. 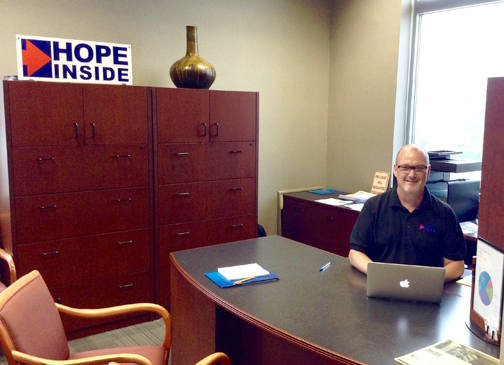 Operation Hope has partnered with banks across Tennessee to place financial counselors – who are employed by the organization, not the bank – in bank branches. The counselors offer free workshops and free one-on-one counseling to anyone who wants it. “I get people who make $10,000 a year and I get people who make approaching six figures,” DeJarnette explains. DeJarnette, who works out of the First Tennessee branch in Inglewood, typically meets with his clients once a month over a year-long commitment during which they work toward the client’s goals. Operation Hope has two locations in Nashville at First Tennessee branches, and two in Memphis at First Tennessee and SunTrust. It will add more locations in Tennessee, beginning in Chattanooga and Knoxville. Employers are also getting into the act. Financial wellness is a big buzzword among employers who are adding financial workshops and coaching to their employee benefits package along with 401(k)s and health insurance. That’s because the workplace is where many people, especially those who work for large employers, make some of their most important financial decisions, according to the federal Consumer Financial Protection Bureau. Decisions on how much to save for retirement, what kind of health insurance to get, and whether to take advantage of tuition reimbursement and life, disability and long-term care insurance can have a far-reaching impact on financial well-being. Americans consistently name finances as their top stressor, and it carries over into work. Employees who are worried about their finances are less productive, more distracted, take more sick days, and are more likely to have health issues and wage garnishments and take out loans on their retirement savings. That’s why 76 percent of large employers are providing some kind of financial health program to their employees this year and two-thirds plan to expand it, according to the National Business Group on Health. Recognizing the mounting student debt crisis, more employers are considering helping employees repay their student loans – a relatively new benefit. Regions Bank offers large employers a Workplace Banking Program that sends bankers into companies once or twice a quarter to teach employees about budgeting, debt management, credit, saving and investing for longer-term goals, homeownership and more. Such programs, targeted to employees’ needs and implemented well, can potentially save employers up to $3 for every dollar they invest by improving employees’ work performance and productivity, according to the Society for Human Resource Management. One of Tennessee’s biggest employers, state government, is ramping up its efforts to help public employees manage their money and save for retirement. The state is launching a new financial wellness plan called Retire Ready TN for the public employees who make up a huge chunk of the Tennessee workforce. There are about 232,000 active members in the state retirement plan, which covers all state and higher education employees, public school K-12 teachers, and the employees of nearly 500 public entities such as utilities, counties and municipalities. Many people believe that Social Security, the equity in their home and any workplace retirement savings, whether a pension or 401(k) plan, will cover their retirement needs. That’s not necessarily so. Too often, public employees don’t start thinking about whether they’ll have enough in retirement until it is a few years away, says Shelli King, communications director for the Tennessee Department of Treasury. The division is launching Retire Ready, a comprehensive retirement counseling program to reach employees early in their careers so they maximize their benefits. 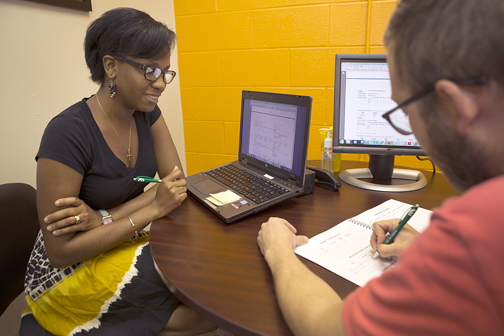 Sabrina Francis, left, a financial counselor with the Nashville Financial Empowerment Center works with Ryan Ellis, a volunteer at the center who is learning as he shadows the counselors. “We’ll go to them and say, ‘Here’s your pension and here’s what this means, but here’s what you need to do to make sure there is enough money for you in retirement,’ says Harris. The Treasury is also testing a financial wellness program with 50 Dickson County employees. The employees get access to Emerge, an online financial wellness platform, and the state may expand the program to more public employees after an evaluation. Dickson County Mayor Bob Rial says the program not only helps employees manage their own finances, but gives them a better understanding of how the county and local businesses budget revenue. One of the first things Rial did when he was elected in 2010 was to increase pay for the 350 employees on the county payroll. But Rial, a former banker, also wanted to offer assistance with financial planning. “Historically, county government employees have not been paid that well,” Rial says. “As a consumer lender, I witnessed how individuals had a lot of trouble with limited incomes and credit, so I felt like we should not just give them raises but help them manage and maximize the dollars they’re receiving. Rial adds that while it’s been a challenge for some employees to devote time to the program, he’s heard positive anecdotes from employees learning to better manage their credit and paying more attention to their credit scores. The Treasury’s goal of changing the financial culture in Tennessee from one of bankruptcy to one of savings might take several generations to achieve. But Morgan says it’s entirely possible – over time. “I think we have to set high goals in order to make measurable difference,” Morgan says. Tennessee’s education efforts may be starting to pay off. Bishop says she’s starting to see some signs of change in Apprisen’s younger clients. While student loan debt and underemployment remain problems, young people aren’t using credit cards to buy things they can’t afford at nearly the rate of previous generations. That’s caused the agency to refocus its services from credit card debt management to financial coaching for next-level financial goals such as saving and buying a house. And they’re also coming in with a higher degree of financial sophistication. “They know the jargon and can engage in a conversation,” Bishop says of younger clients. “It’s positive that people are seeking out financial advice and financial literacy options.